Classifies As A "Classic" Game. Is The Most Recent Version. Other Info: The sound for Devilish: The Next Possession is done by Hitoshi Sakimoto who tends to use the abbreviation of "YmoH.S". It's said that the developer is Aisystem Tokyo, but I didn't see anything in the credits. I'll keep them listed until I can find more info regarding them though. 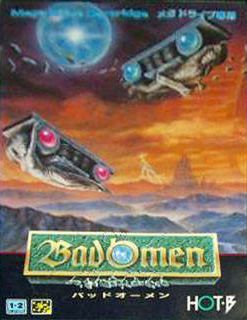 This game is also known as Bad Omen. Whenever you are dealing with a game that just so happens to be multi-platform, you have to consider several things before you actually decide which version of the game you will choose. Which version of the game is the best? Is there a handheld version? Are you one who wants to play at home or on the go? What's the price between versions...and so on...and so forth. If you were one of the proud owners of a Sega Game Gear back in 1991, you may have already experienced Devilish. 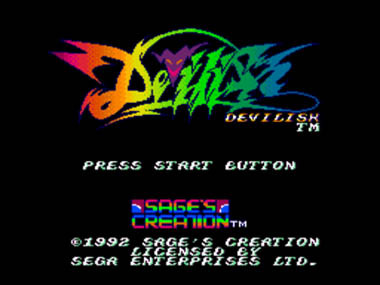 Sage's Creation (who published copies of Devilish for Game Gear) thought that Devilish did pretty well and in 1992, they published another version of Devilish by the name of "Devilish: The Next Possession" (or some prefer to call the game "Bad Omen", its Japanese name). If you haven't played either port of Devilish and you are wondering which one you should get, the choice SEEMS obvious. Logic would dictate that the Sega Genesis (a home console) version would be superior to the weaker and inferior Sega Game Gear (a handheld) port...and who can blame anyone who has that logic, right? The Genesis is more powerful and the port is newer and SHOULD be improved over the handheld port. The problem with this is that ports of games were very tricky in the retro game world. You can't just assume that one port will automatically be better (or even the same) than the next, regardless of whether or not it is on a handheld or whatever. 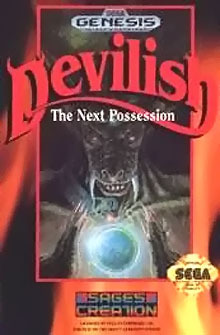 When you think of the title of "Devilish: The Next Possession", you kinda want to think that it is actually a sequel to the previous game. However, the story remains the same as the original Game Gear port. You play the role of a prince and a princess who get turned into paddles (YES...paddles that you would use in games like Pong...) by the jealous devil named "y". Leaving you powerless, "y" soon goes around spreading darkness and chaos across the kingdom. Just as all seems lost, a mysterious blue orb appears in the sky and it gives our paddle heroes the power to defeat the demons and put an end to the madness. As stated in my Devilish review for the Game Gear, "y" is actually named "Gamma". The only reason the developers changed the name to "y" is so that it would be easier to fit the opening story dialogue because "Gamma" was too big to use it where it was intended. "y" just so happens to be part of the Greek alphabet. 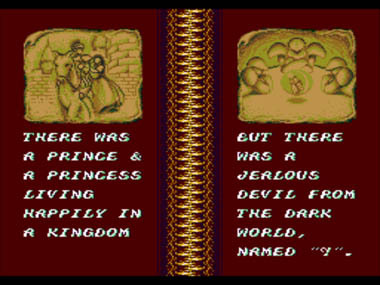 One thing to note about the plot is that the Genesis game has a brief opening that explains the story to some degree while the Game Gear game doesn't. The plot for the GG game is on the back of the box. Despite having the same plot, D:TNP has completely redone graphics (which should come as no surprise) that make much better use of the Genesis hardware than had they just put the Game Gear port on Genesis with no changes and called it a day. There are some similar stages (such as the grave yard and waterfalls) from the original version that have been changed to look like completely different levels. The enemies are significantly more detailed, the sprites are sharper and larger and certain enemies look great. The environmental effects are even better than the original and include such elements as clouds, rain, volcanoes that burst out fire, and an ocean water effect that wavers back and forth with your paddles and ball being under the water while pillars are seen above the water. The old stages from the original game have been redesigned too and while some stages were removed, there are a couple of new stages too. All of these improvements come at a price though...the game lags at several segments in the game with some slowdown. The soundtrack for D:TNP is fantastic. The soundtrack is done by Hitoshi Sakimoto and the music is clearly the highlight of this game. 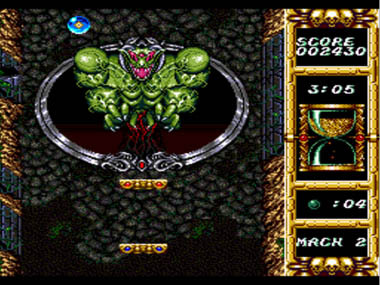 The game takes the great melodies of the Game Gear game and improves them even further. Like the Game Gear game, D:TNP features adventurous tunes that enrich your game playing experience and sets the mood of the game. It doesn't matter what stage you are on, the music remains solid from start to finish. The sound effects themselves are the typical bleeps and bloops that you probably already know about. Unrealistic (but fair) explosion noises, unrealistic bouncing sounds, etc. 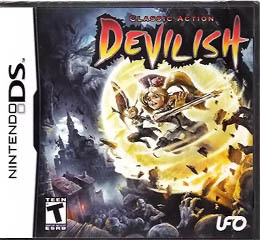 The game attempts to say the word "Devilish" when you are on the title screen, but it doesn't sound good at all. Ah well...it's a good thing they didn't try to flood the game with other unnecessary voice clips. 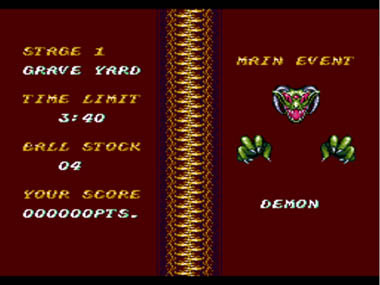 If you've already played Devilish for Game Gear, then D:TNP will seem like a "Hard-Type" version of that game in some regards. 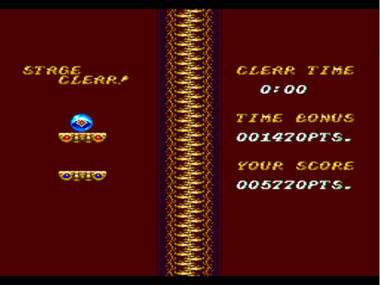 While the Game Gear game allowed you to use four different paddle formations to help you guide the ball through the stages, D:TNP removed one formation for unknown reasons. You can't create three paddles in this game like you could in the original game. This leaves you with your standard formation with one paddle on the top and one on the bottom. The other two forms put the top paddle to the left or right of the bottom paddle and they turn 90 degrees and you should use these formations to guide the ball around corners and such. D:TNP has also removed 1-ups from the power-ups that you could obtain from hitting treasure boxes. You can still gain 1-ups from points and one other special event, but 1-ups could also come in the shape of a purple orb in the GG game. Your paddle starts small in D:TNP too. You must actually grab a powerup to make your paddles bigger for a limited amount of time. When they do get bigger, they are the same size as the DEFAULT paddle size of the GG game. The GG game has no power-up to increase paddle size. You can also grab a bomb, an item to temporarily stop time, and an item that increases the power of your orb. To add to this, if you hit boxes marked with an "X" in D:TNP, you temporarily can't use your top paddle. In the GG game, your paddles simply shrunk down to a smaller size. The game is still time-based like the GG game, but this time around, you have the option to choose different paths on certain stages. Depending on what path you choose, you can save time or waste time. You can also fly through cannons to help you save time to reach the end of the levels faster. It's also nice that while there isn't a boss on every stage, D:TNP attempts to put a "main event" on each stage (unlike the GG game, which either had a boss or didn't). Some main events are boss fights while others are just little bonus rounds of sorts. The big problem with D:TNP is that the gameplay is more flawed than the GG game. 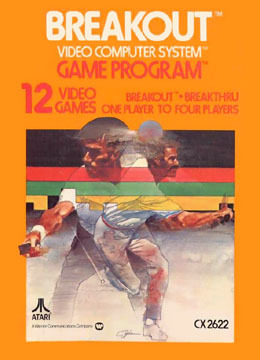 The "Pong Physics" are even more inaccurate and the ball can prove to be unwieldly at times. To add to this, the levels are significantly more cluttered than the GG game which can make some parts of the game needlessly frustrating. The game only has seven stages for some strange reason (the GG game had eight) and there are three different endings (though they aren't too great) depending on difficulty settings. There is also a 2-player mode (not available in the GG game) where one player controls the red paddle and the other player used the blue one. So which version should you get? I would personally choose the Game Gear game because it just seems to be more balanced. The Genesis game has nicer visuals and sound, but the cluttered stage design and somewhat broken physics of the game can get pretty annoying. 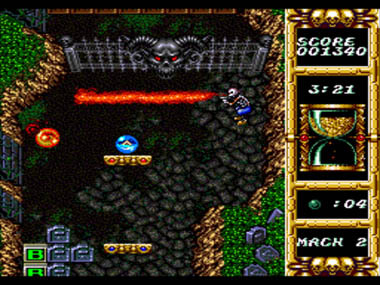 The Genesis game is fairly decent and good if you are seeking more of a challenge, but Devilish is also short and easy enough to get into. Therefore, Devilish for the Game Gear just so happens to be the ideal choice for someone like myself who is always on the go. Not only that, it's a fine game in its own right. You may want to play the Game Gear version before you set out to get the Genesis version. This review has 41 extra images. See credits for Devilish: The Next Possession.